Toroweap Overlook is 3,000 vertical feet above the Colorado River and offers breathtaking views of the Grand Canyon. 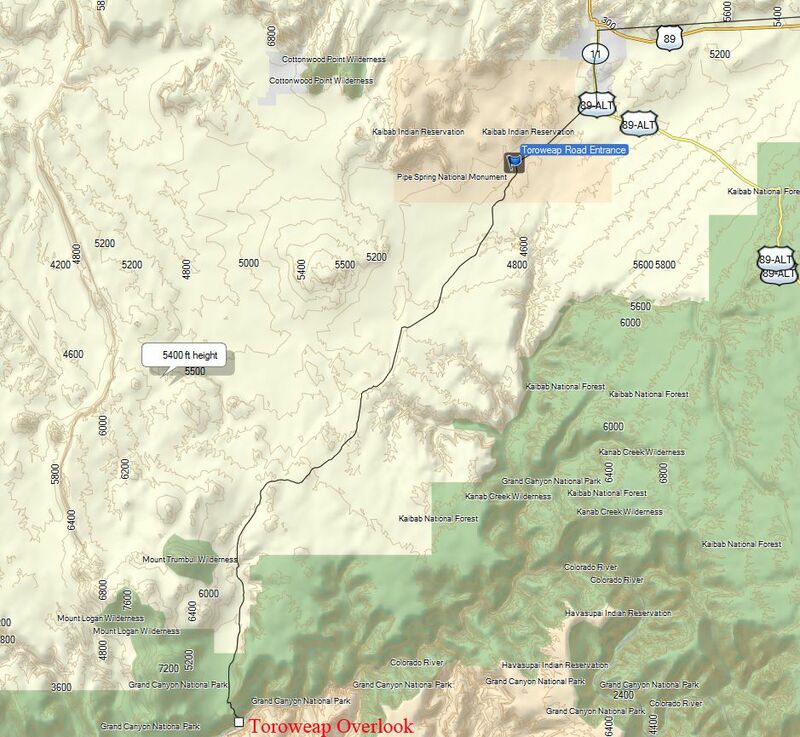 Download free directions, maps, GPS and photo advice for Toroweap by selecting the Maps and Direction tab above. Select the YouTube icon below to watch a short travel video on Toroweap. The BLM sells Arizona Strip Visitor Maps are sold at the BLM office in St George, Utah at nearby Pipe Springs National Mounument, and at the Kaibab National Forest office in Fredonia. Sunshine Route (BLM Road 109) the primary route, leaves Highway 389 about 8 miles west of Fredonia or about 6 miles east of Pipe Spring National Monument. It is 61 miles / 100 km long and is the most reliable route, but is subject to washboarding. Note: the last 3 miles requires a semi-high clearance vehicle such as a Subaru or Ford Escape. Allow 2-3 hours to cover the 61 miles from Hwy 389 to Toroweap Overlook. Clayhole Route (BLM 5) leaves High 389 at Colorado City. It is 60 miles long but may be impassable when wet. Main Street Route (BLM Roads 1069 and 5) from St. George, about 90 miles long but is the most scenic route. This route maybe impassable in winter due to snow on the slopes of Mt. Trumbull. 9 sites are available on a first come basis. Most sites are usually available but may fill up on holidays and weekends. When I visited Toroweap in September I was the only camper. Sites have a pit toilette, picnic table and fire ring. Bring your own firewood. Note: campground is about 1 mile from Toroweap Overlook. Backcountry permits can be obtained at Pipe Springs National Monument or by calling 928-638-7875. The enclosed Suunto degree readings when combined with computer software such as SunPath and a Suunto Degree Dial will tell you what degree and angle the sun will rise. This advance scouting technique is covered in Four Factors of Filter Highlight Photography eBook. Download a free copy of the Four Factors of Filter Highlight Photography in PDF format by selecting the “ebook download” tab above. This 37 page guide covers how to take a single image and apply minor manipulations that will help you produce consistent reproducible results. You will also learn the processes of camera set-up, image editing, and advance scouting techniques used by professional photographer Christian James. Free park maps, tide tables reports, ebooks and additional information can be found under the Maps and Resource tab located in the black bar at the top of the screen. The best time to photograph this location is sunrise. Nikon D3x 14-24mm Lens @ 14mm f11@ 1/80 second ISO 100 Exposure Value +1.0 with a 3 Stop (0.9) Soft-Step Spilt ND Filter. 9/7/11 6:18 a.m.